The Nicholson Museum continues to please with its latest exhibition. 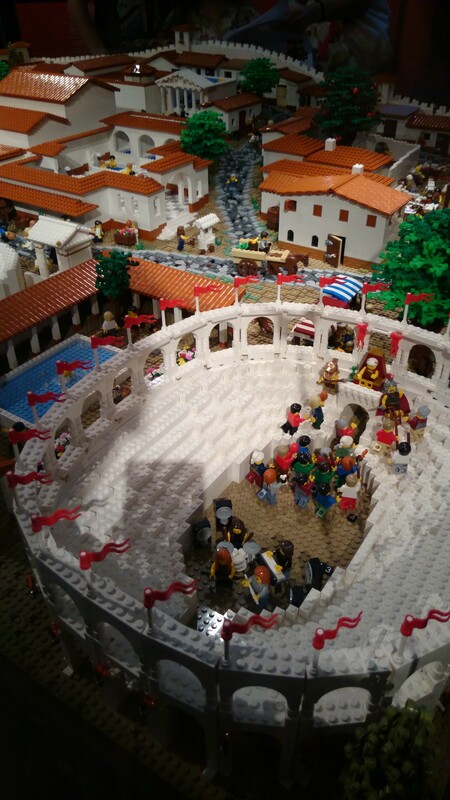 I don’t know who came up with the idea of using LEGO to illustrate the ancient world at the Nicholson Museum, but I do know that it was a fabulous idea. The Nicholson’s latest offering is LEGO Pompeii, and it’s great. I love the way that the creators have woven millennia of history into a single diorama. So daily Roman life rubs shoulders with archaeologists digging the ruins and even Dr Who subtly visiting. The use of LEGO makes the whole thing both intriguing and fun. Of course the danger in this approach lies in losing sight of the reality. For example my Senior Junior Archaeology Correspondents were scandalised by the depiction of lava beneath the city streets which, as they were keen to point out, is not how the eruption occurred. But that danger is balanced by excellent poster-boards of information surrounding the LEGO exhibit. Even without the LEGO diorama, the Nicholson is worth visiting for its small, but always fascinating, collection. Although the Nicholson is small, it continues to punch well above its weight with a creative and innovative approach to an ancient subject matter. Their website has all the details on planning a visit. See also: The Nicholson is a jolly fine museum. ← Does everything need a battery in our new World?